Urgently needed as a present for my beloved neighbors. Can't stand one more weekend listening to their Karaoke Who knows where to buy this kit in Bangkok? Who knows where to buy this magnificent invention in Guangzho ? Deep in our hearts, we all like to sing, even for a little bit. But only a small number of us can sing well. Others end up as laughing stocks to people around them. But not anymore! Say hello to the Noiseless KaraOK!. 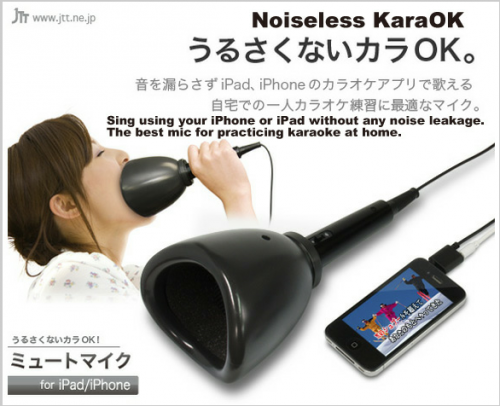 Yes, you heard it right — a noiseless karaoke machine. The design is very simple. A muzzle, which they call a “mute cup,” connects to your iPhone or iPad, and and there you go! You can now sing your heart out without anyone hearing. This “mute cup” contains a microphone and polyurethane, which reduces noise. 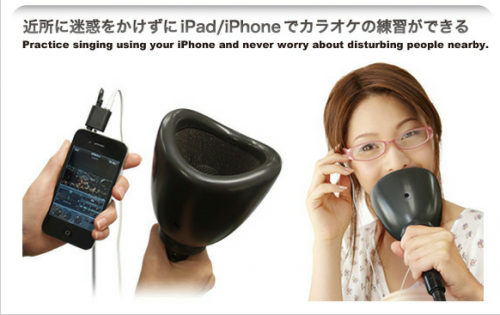 It also fits around your mouth perfectly, eliminating unwanted sounds and making sure it lives up to its name. How does it work? Well, it’s easy. As sound reaches the mic, your iPhone or iPad detects it and can create an “isolated environment,” of course with the help of karaoke apps such as SegaKara. The only problem with this product is that people do not need it. Even the shyest person in the world wouldn’t need this. I think most people won’t spend money just to stop others from hearing them sing. I neeed it and eager to pay. My neigbors next door are killing me!! !